Using our novel materials, we can create components with almost any geometry. By combining our materials in a single component, we can create multi-functional parts, not possible with other manufacturing technologies. Examples of this are combining composites to absorb both primary and secondary radiation, flexible and rigid materials as well as using expensive materials only where needed. We offer single custom components as well as small-to-medium sized batches. We provide components in our novel B4C composite materials. Depending on your application, components can be made with both natural B4C as well as isotopically enriched B4C composites, and with a particle loading of up to 60% w/w. 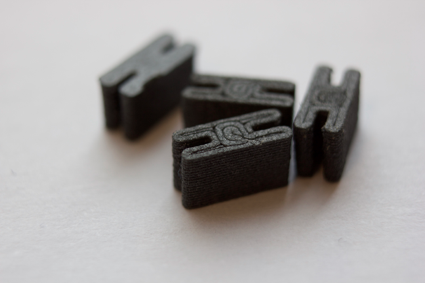 If your application requires resistance to high temperatures, chemicals or excellent mechanical properties we offer prints in a range of high performance plastics such as PEEK, PEI, PPSU and other commercially available engineering plastics. We offer printing and consulting services for many different polymers and composites. Please contact us if your applications requires polymers not listed above.